Avocado with prawns, lime, coriander and bacon bits | Is Life a Recipe? 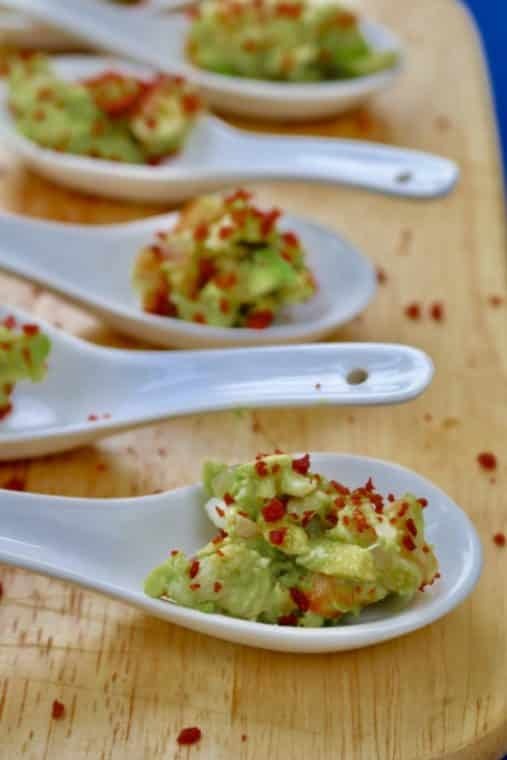 Avocado with prawns, lime, coriander and bacon bits, was a new recipe I made up for a ChillaxBBQ we did this weekend for a friends birthday. It turned out to be a head-turner, with many asking for more and more, and also for the recipe. So in the spirit of ChillaxBBQ sharing, here is that new recipe from us. Believe me this is simple and it is bloody good! Served on spoons this weekend, but of course you could share in a serving bowl with some chips to allow some social dipping. Bring it on!!! Zip it up and give it a good mix up and let marinade for 1-2 hours. Sprinkle over the bacon bits. That’s it – told you Avocado with prawns, lime, coriander and bacon bits was simple. But it seriously so good, flavour explosions and texture pops all over the place. Loving this new dish. This will be repeated. Give it a go and I guarantee you will – ENJOY!!! No Replies to "Avocado with prawns, lime, coriander and bacon bits"